Polyphagotarsonemus latus, this species has a large host range and is distributed worldwide. Female mites are about 0.2 mm long and oval in outline. Their bodies are swollen in profile and a light yellow to amber or green in color with an indistinct, light, median stripe that forks near the back end of the body. Males are similar in color but lack the stripe. The two hind legs of the adult females are reduced to whip-like appendages. The male is smaller (0.11mm) and faster moving than the female. The male’s enlarged hind legs are used to pick up the female nymph and place her at right angles to the male’s body for later mating. 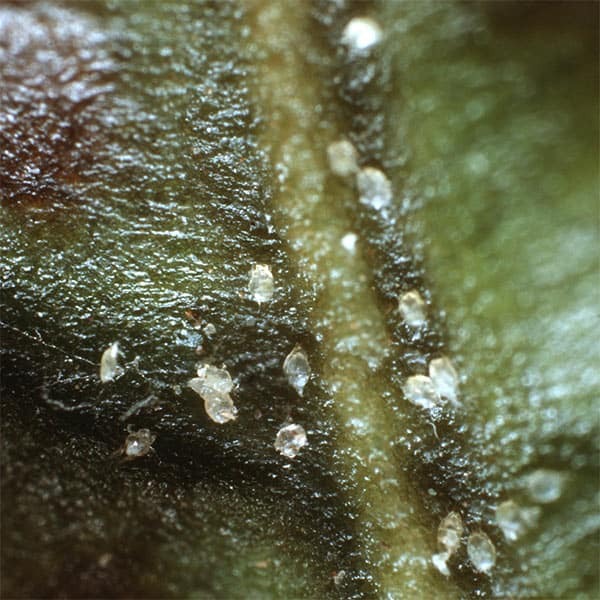 The broad mite has four stages in its life cycle: egg, larva, nymph and adult. Adult females lay 30 to 76 eggs (averaging five per day) on the undersides of leaves and in the depressions of small fruit over an eight- to 13-day period and then die. Adult males may live five to nine days. While unmated females lay eggs that become males, mated females usually lay four female eggs for every male egg. The eggs hatch in two or three days and the larvae emerge from the egg to feed. Larvae are slow moving and do not disperse far. After two or three days, the larvae develop into a quiescent larval (nymph) stage. Quiescent female larvae become attractive to the males which pick them up and carry them to the new foliage. Males and females are very active, but the males apparently account for much of the dispersal of a broad mite population in their frenzy to carry the quiescent female larvae to new leaves. When females emerge from the quiescent stage, males immediately mate with them. This destructive pest causes terminal leaves and flower buds to become malformed. The mite's toxic saliva causes twisted, hardened and distorted growth in the terminal of the plant.